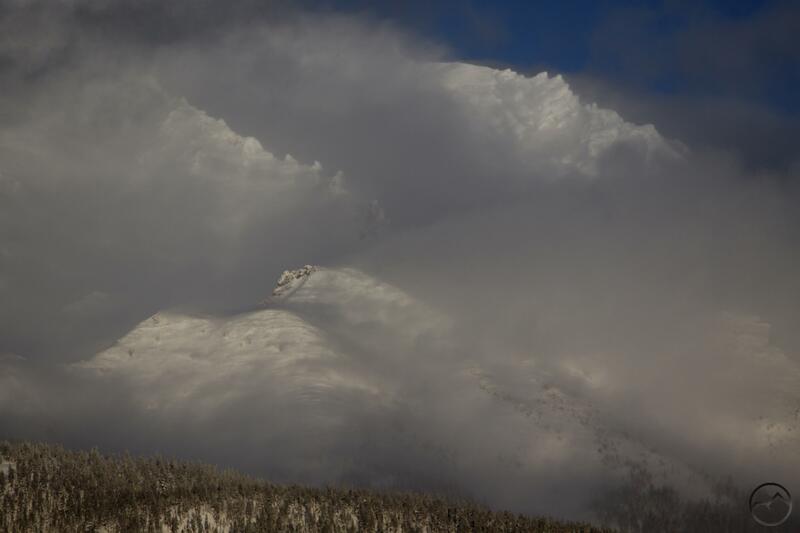 Ridges on Mount Shasta peek out of storm clouds. The North State has seen a strong series of storms pass through the region, dropping lots of snow and rain along the way. Not only has snow fallen on the higher elevations but it has come in abundance at the lower elevations as well. This is an enormous blessing for the entire state since the water that falls up here is, through the agency of federal Central Valley Project, distributed throughout the rest of California. Up until the last few days, most of the precipitation has fallen as snow. Then, on Sunday, the temperature rose and a hard, sustained rain began to fall. Though there were breaks in the storm, this continued for three days. Other than a hot day, nothing melts snow like a warm rain and melt the snow has. While the high elevation areas still have plenty of snow, the lower areas have seen a significant decrease in the amount of accumulated snow. Here are two images of my backyard as an example. The first is from last Friday, the 15th. The second is from this morning, the 20th. The gullies, streams, creeks and rivers are all swollen with run off at this time. Whether or not it is still raining, now is a great time to get out and hike along one of the trails that flank a creek or river. The allure of raging water is difficult to deny. Those along the Sacramento River are particularly dramatic and none may be more so than the short trail along Hedge Creek. The falls are engorged, with numerous secondary cataracts cascading over the columnar basalt. The trail behind the falls is still passable and the creek below the falls is a swirling monster of fast moving water. The overlook above the river gives an excellent perspective on the Sacramento River. The fury of the water is humbling. The pounding as it hits the rocks, the thunder of the impact and the spray thrown from the falls is quite impressive. Getting closer to the Sacramento River is also a worthy experience. Where the falls are kinetic and loud, the river is surging and almost quiet in its enormous power. It is almost understated, but standing next to it, feeling the pulsing drive of the water is exhilarating. Despite the hard rain, there have been times over the last couple days when the clouds cleared and Mount Shasta was visible again. That was the time to get out, carry on, and enjoy the white mountain once again. My son walks his pony after his riding lesson during a break in the storms. 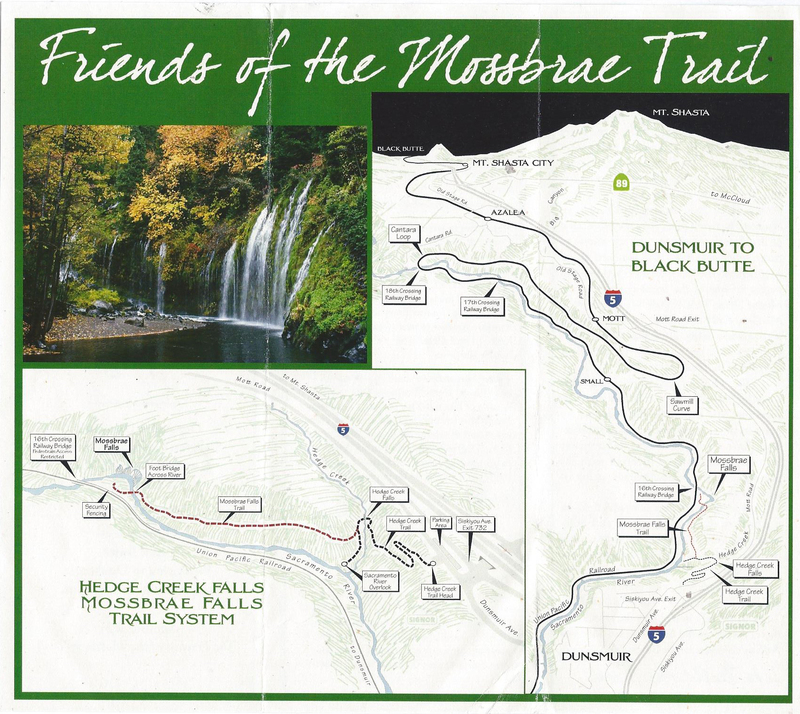 The Mossbrae Daylight’s special run from Dunsmuir to Black Butte on June 20th highlighted the efforts to build a new trail to Mossbrae Falls on the Sacramento River. The falls are one of the most beautiful and unique in northern California. Cascading down rocky, moss-covered cliffs into the Sacramento River, the falls is not a single stream. Instead, it is a collection springs bursting from the cliff and raining down into the river below. The combination of dense forest, rushing river and wispy waterfall is a magical scene. The only drawback is the difficulty getting to the waterfall. Until 2010, hikers could follow the railroad tracks for a little over a mile to a lovely elbow in the Sacramento where the falls were located. However, late in 2010 the Union Pacific Railroad blocked off access to the parking area. This prevented from hikers parking near the tracks which eliminated the preponderance of people making the trip to the falls. Now only those willing to hike much further or are clever or obnoxious parkers make the journey. Ever since the trailhead closure, efforts have been underway to gain public access and construct a trail to Mossbrae Falls. A number of possible routes were investigated, routes on both sides of the Sacramento River were considered. Numerous interested parties have invested considerable time and resources to this process and it seems that a general consensus as to the ideal route has been reached. These groups include the City of Dunsmuir, the Mount Shasta Trails Association, a local landscape artist and trail engineer (this person has been involved in most of the new trail construction around Mount Shasta for several years and is an important part of many successful trail building teams) , as well as other concerned parties in the form of the Friends Of The Mossbrae Trail and private citizens. The leading proposal for a path to Mossbrae Falls is to construct an extension of the Hedge Creek Falls Trail. The current route begins near I-5 and descends gently down into Hedge Creek’s canyon. It then passes behind Hedge Creek Falls and continues downstream on the far side of the creek. The trail ends at an overlook above the Sacramento River. Here there is a good vantage of Mount Shasta and the rushing river below. The proposed route to the waterfall would continue beyond the overlook and proceed upstream along the Sacramento for about 0.3 miles. It would then cross over the river on a newly constructed foot bridge, just downstream from Mossbrae Falls. The bridge would have an excellent view of the falls curving around a sharp bend in the river. A number of improvements along with the trail itself have been suggested. It is important to remember that this proposal is actually an expansion of the city park at Hedge Creek Falls. Consequently, the facilities at the trailhead would be upgraded, making them appropriate for what would be no doubt be one of the most popular trails in the Mount Shasta area. The path itself would be paved and well graded to allow hikers of all abilities to make the walk. This would necessarily require the construction of a bridge across Hedge Creek just downstream from Hedge Creek Falls. A new overlook, higher up from the first and boasting a better view, would be built. Another improvement would be the addition of a picnic area tucked into the flat at the falls that lies between the river and the railroad tracks. All of these improvements would make this trail a premier and popular pathway. Amazingly, most of the funding is in place, thanks to some private donors and the generosity of Union Pacific. It is natural to view the railroad as an antagonist since they blocked off access to the falls but, truth be told, they have actively pursued the construction of the trail and have committed substantial monetary support to the effort. They are aware how important Mossbrae Falls is to the community and want to facilitate public access to this landmark. As things stand now, the single most significant obstacle to the construction of the trail is the ownership of the land necessary for the trail to travel upstream along the east side of the Sacramento River. This property currently belongs to the Saint Germain Foundation, owners of the old Shasta Springs Resort property. The primary effort of Friends Of The Mossbrae Trail has been to convince the powers-that-be at St. Germain to sell the narrow strip of land to the City of Dunsmuir. Thus far, this single issue is the key to the logjam that prevents the trail’s completion. St. Germain is justifiably protective of their privacy and strongly discourage trespassers. Part of the proposal for the trail is the construction of a fence that would block access to both the railroad track and the St. Germain property. The bridge over the McCloud: a possible template of the Mossbrae Trail. There are obviously other issues that must be overcome in order for the trail to be completed. One of the most significant is the construction of the footbridge across the river. There is no road access along the river, which means the only avenue of getting construction equipment to the site would be via the tracks. This would likely include a rail crane. 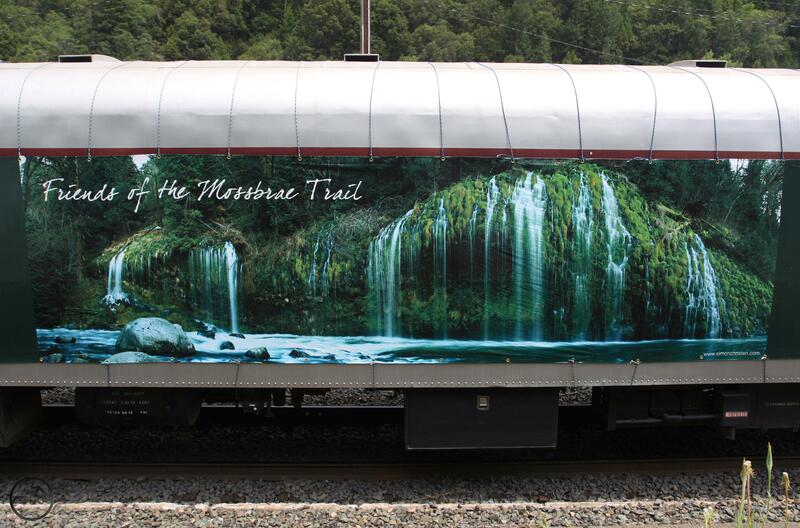 This is another way the Union Pacific will play a role in providing access to Mossbrae Falls, since any time a crane is on the tracks is time freight or passengers are not being pulled up the Sacramento’s canyon. As far as what kind of construction would be employed for the bridge, that is too early to tell. However, given the similar engineering challenges (lack of access for construction equipment, comparable river sizes), it is possible that the bridge would looks something akin to the PCT bridge as it crosses the McCould river just below the McCloud Dam. So what do I think of the proposal? Obviously it would make a fantastic, world-class waterfall trail. A hike on this proposed trail would include Hedge Creek Falls (and a chance to go behind the waterfall), a unique view of Mount Shasta and the Sacramento River, an excellent, riverside section of trail capped by a view-endowed span across the water and the beautiful area around Mossbrae Falls. All these components would be packed into a fairly short trail. It would probably be only about 1.5 miles or so, round trip. 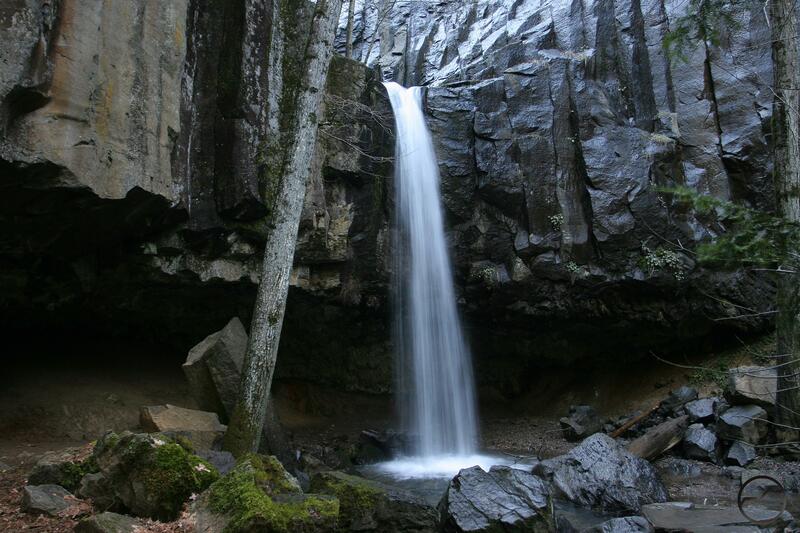 Indeed, this would rank alongside the McCloud River Falls Trail and the Burney Falls Trail (and the Trinity Alps’ Canyon Creek, though that is another story) as one of Northern California’s premier waterfall trails. I do have some reservations about rerouting the trail across a bridge over Hedge Creek Falls rather than behind the waterfall (a truly unique aspect for a California trail) and the proposal to pave the entire route. Obviously, both of these additions would make the trail more accessible and that is a good thing. However, if the pavement and Hedge Creek Bridge detracted from the natural experience, then that would be a loss. If that is the price of being able to build a trail to Mossbrae Falls, then it would be a price worth the cost. It seems that the decision now lies with the leaders of the St. Germain Foundation. It is up to them whether they sell a narrow strip of land along the river or not. I hope, for the sake of the community, that they are willing to do so. 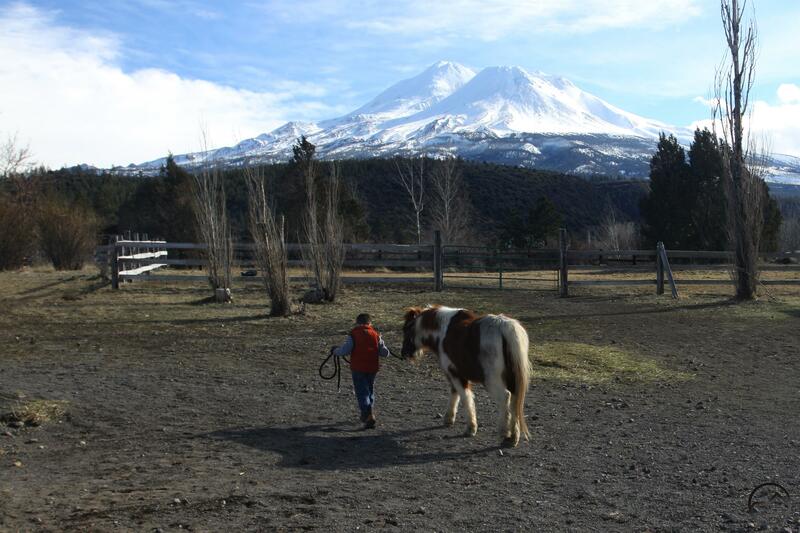 If they are, then the Mount Shasta area will be blessed with a tremendous hiking trail. In an area as spectacular as Mount Shasta, it takes a lot to elevate a trail beyond the ordinary and into the hiking firmament. 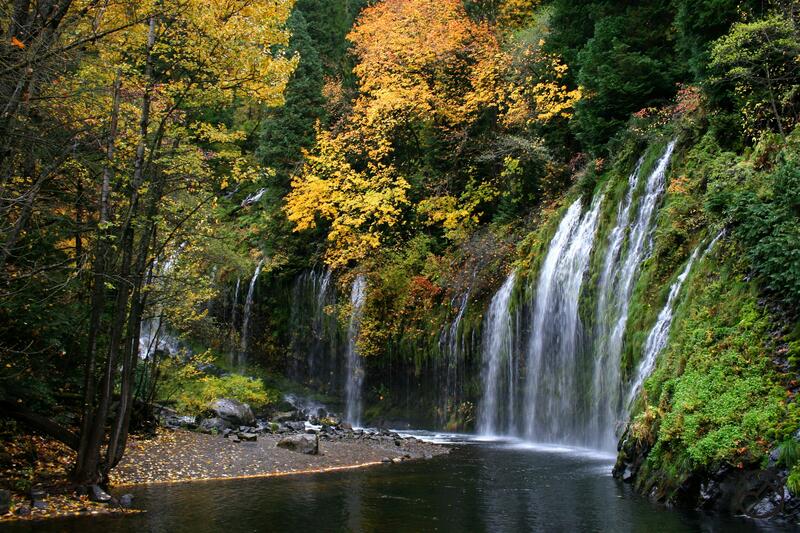 A trail that combined Hedge Creek Falls, Mossbrae Falls, The Sacramento River and Mount Shasta would do just that. The Sacramento River, California’s longest and largest waterway, begins in the Trinity Divide just west of Mount Shasta. 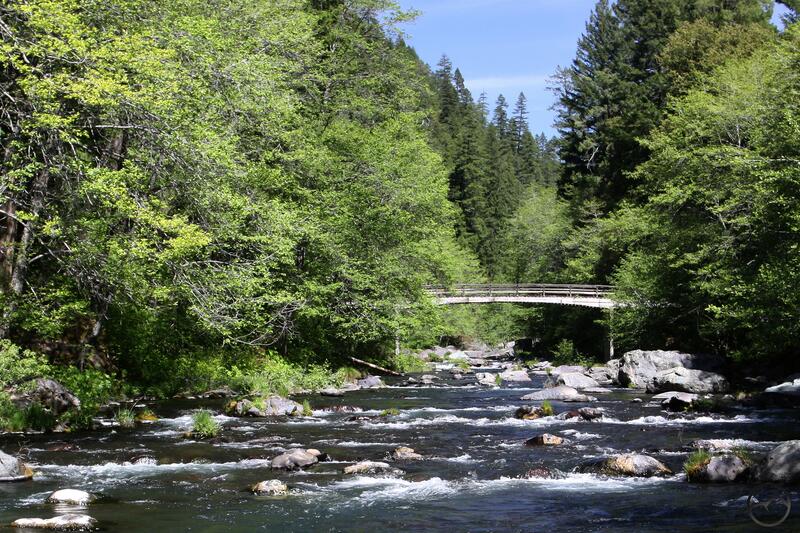 With the exception of the impoundment at Lake Siskiyou, it is a wild, surging river that races over numerous rapids and through deep canyons and narrow gorges. 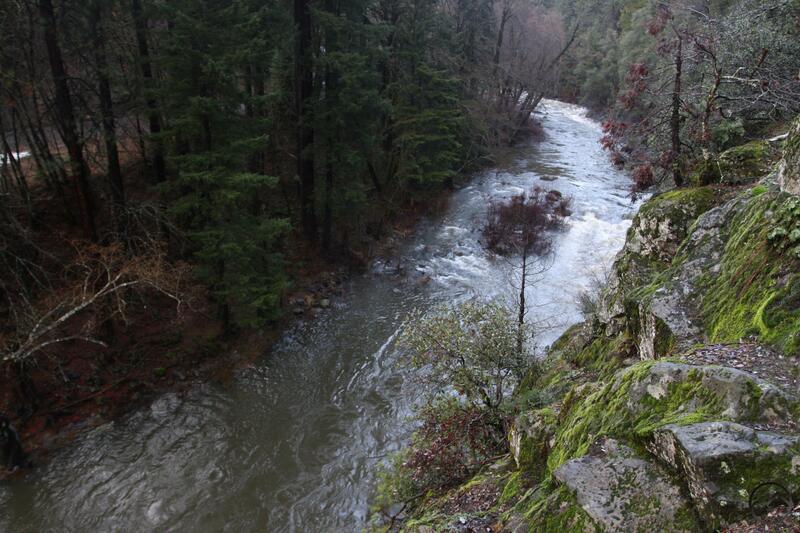 However, unlike its nearby tributary the McCloud River, the Sacramento does not go over any major waterfalls. Where the McCloud has its trio fantastic cataracts, the Sacramento only has a seemingly endless succession of rapids. Yet, what the river itself lacks in plunges, it makes up for in waterfalls pouring into the river and on tributaries just above the Sacramento. These falls lack the volume of those on the McCloud because it is not the river itself going over the precipice. Though they lack thundering power, the waterfalls along the Sacramento River make up for in unusual geology, unique settings and outright grace and beauty. None of the waterfalls along the Sacramento require difficult hikes, though they are all reached via unconnected trails. Nonetheless, they are fairly close together and for those in search of falling water, the Sacramento’s waterfalls make for an excellent afternoon. The undisputed monarch of the waterfalls along the Sacramento, Mossbrae Falls is actually a series of springs that burst from the cliffs above the river and then rain down in a glorious cacophony into the water as it flow swiftly by. Though the spring complex is large and small flows can be spotted on the approach to the falls, Mossbrae Falls is composed of two primary clusters of spring-fed waterfalls. These are arranged around an elbow in the river, which gives the falls a sense of depth and complexity that are absent in many other waterfalls. The presence of the river beneath the falls enhances the scene and makes for one of the prettiest sights in the Mount Shasta area. Since the source of Mossbrae Falls are numerous springs, the falls do not flag later in the season like many other waterfalls do. Consequently they are great year-round. The best time to enjoy the falls is in the fall, when the foliage has changed color, making the canyon around the waterfall a glorious explosion of golds and oranges contrasted against the green of the Sacramento River Canyon. If there is a drawback to Mossbrae Falls, it is access. To reach the falls it is necessary to hike along the railroad tracks that are tucked onto a narrow bench against cliffs above the Sacramento River. Though this was common practice for decades and the falls were a popular destination, this is no longer the case. The Union Pacific blocked off access to the parking area a few years ago, making it difficult to find parking near the tracks. To make the journey now, one must find creative ways to park or be prepared to hike a much longer distance from parking places in Dunsmuir. There has been talk about building a bridge across the Sacramento River and linking to the trail that leads to Hedge Creek Falls. For a time there was a fair amount of momentum for this solution but it seems to have flagged recently. If this vision did come to fruition, the trail would make for an incredibly scenic hike. 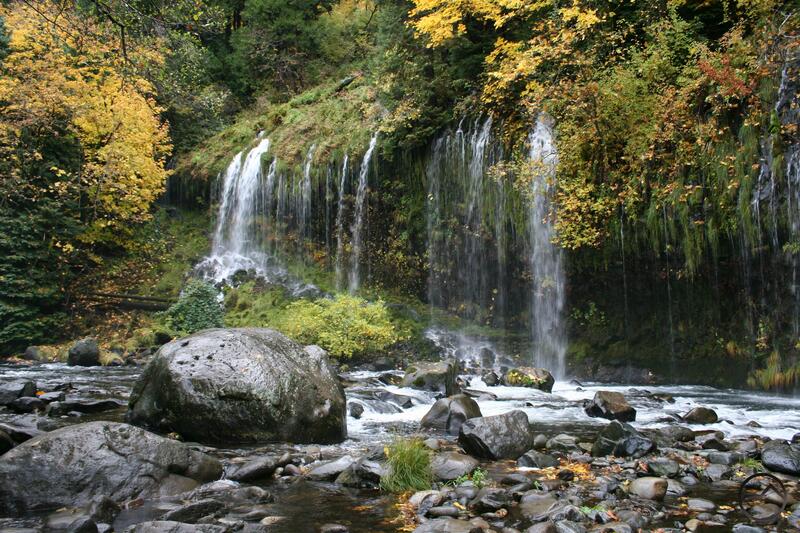 Located right off of I-5, Hedge Creek Falls is the most easily accessed waterfall in the Mount Shasta area. 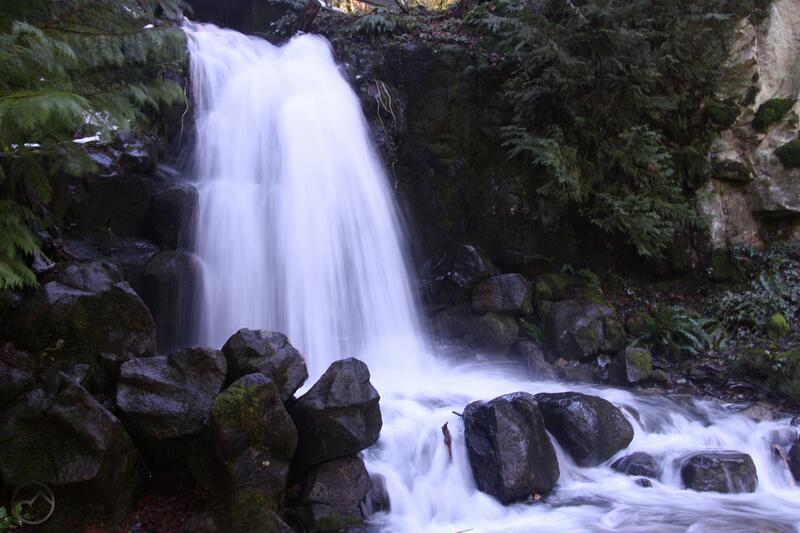 A slender and graceful waterfall, its best flow is in the spring and early spring, though it usually flows year-round. A classic plunge waterfall, Hedge Creek Falls is about 30 feet high and shoots through a narrow, rocky gorge just before pouring over the edge. The most interesting feature about Hedge Creek Falls is the columnar basalt cliff Hedge Creek goes over. The basalt columns resemble those famously found at Devil’s Postpile in the Sierra Nevada, near Yosemite. Rock climbers have developed routes along the cracks in the basalt. The cliff’s real distinctive is the hollow at its bottom. The basalt columns stop about 10 feet short of the ground, leaving something of a cave at the bottom. The Hedge Creek Falls Trail passes through the cave, allowing hikers to view the falls from behind. Though this is the highlight of the trip down the falls, the trail continues a little further to a great vista of Mount Shasta and the Sacramento River. Along the way, the trail passes a few smaller cataracts along Hedge Creek. This small waterfall is easily accessed in the small community of Sweetbriar, which straddles the Sacramento River just south of Castella. The fall’s watershed is small, originating on Girard Ridge and only flowing a short distance. Nonetheless, it maintains a decent flow much of the year. 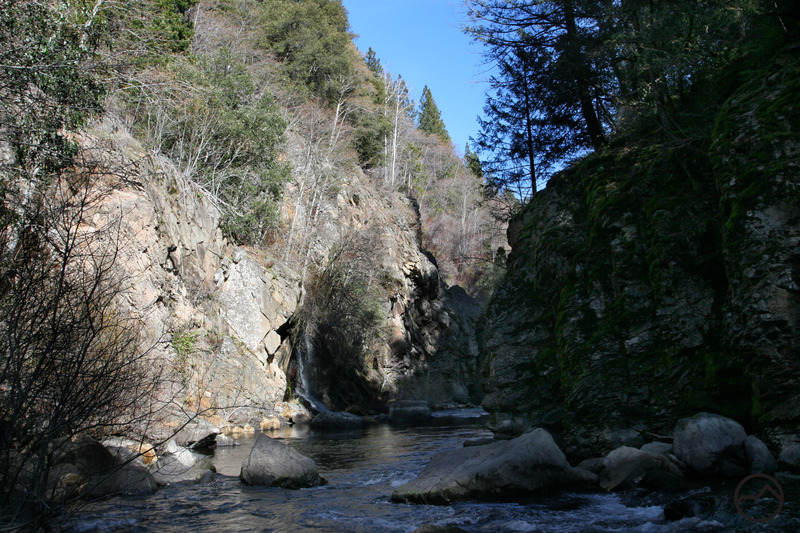 The creek flows under a road and then plunges over a short cliff before dropping down a series of cascades into the Sacramento River. The cliff, which vaguely resembles a columnar basalt formation, has blocky outcroppings that cause the creek to dance and deviate as it drops. At about 20 feet high, it is not a spectacular waterfall but it is a pleasant and refreshing sight nonetheless. Be sure to park in the wide parking area on the west side of the railroad tracks to avoid trespassing on private property. From there, walk east, cross over the Sacramento River and then turn right onto a very short trail that leads to the falls. A wooden bridge crosses the creek just below the falls and leads to a nice vantage point of both falls and river. Falls inside the Box Canyon. There are a few other waterfalls along the Sacramento River. One area that is almost completely overlooked are the waterfalls that pour down the side of the Box Canyon of the Sacramento River. There are two notable waterfalls in the Box Canyon. However, their location along the cliffs of the gorge makes them much more compelling waterfalls. The larger of the two falls is best seen near the beginning of the Box Canyon Trail, along the large rock covered embankment. The other waterfall is best seen by climbing the via ferrata route down into the canyon and heading to the east along the narrow strip of land next to the river. There the falls tumble down the rock wall into the water of the Sacramento River. The falls, though attractive, are part of an overall setting including the river and the sheer, narrow cliffs that is quite impressive.